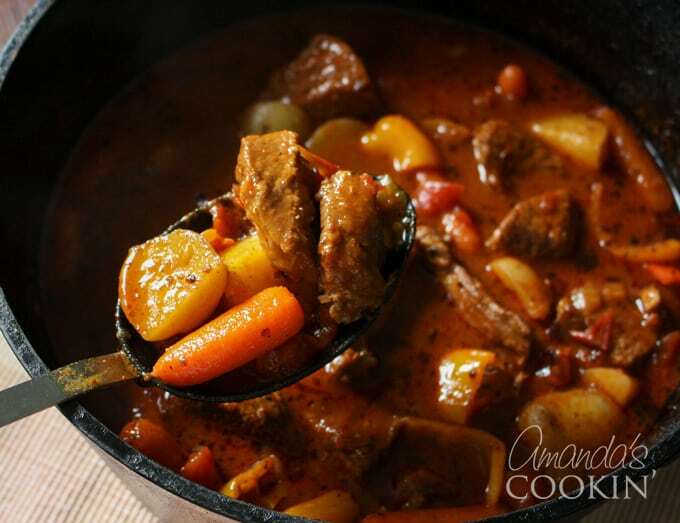 Anytime is the perfect time of year to make this dutch oven goulash. It’s an easy recipe using chuck roast that’s great for weeknights, especially those spent watching kids’ football games in the rain! Come home to a steaming bowl of stew on a brisk autumn day. This is also one of our favorites for “Sunday supper” during the cold winter months. 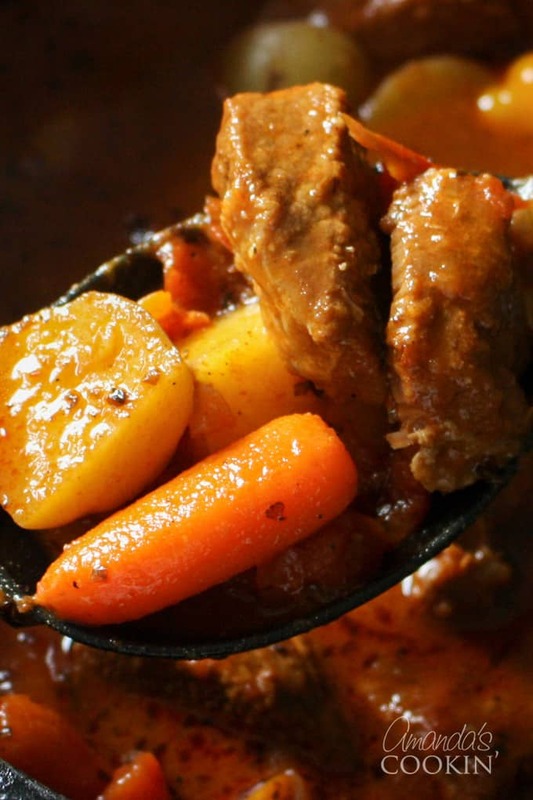 We also love making goulash in our slow cooker – try our Hungarian Goulash too! 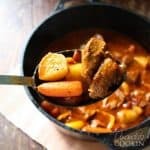 This goulash recipe makes a great family dinner any time of the year, but we all know how stews are embraced during the colder months. 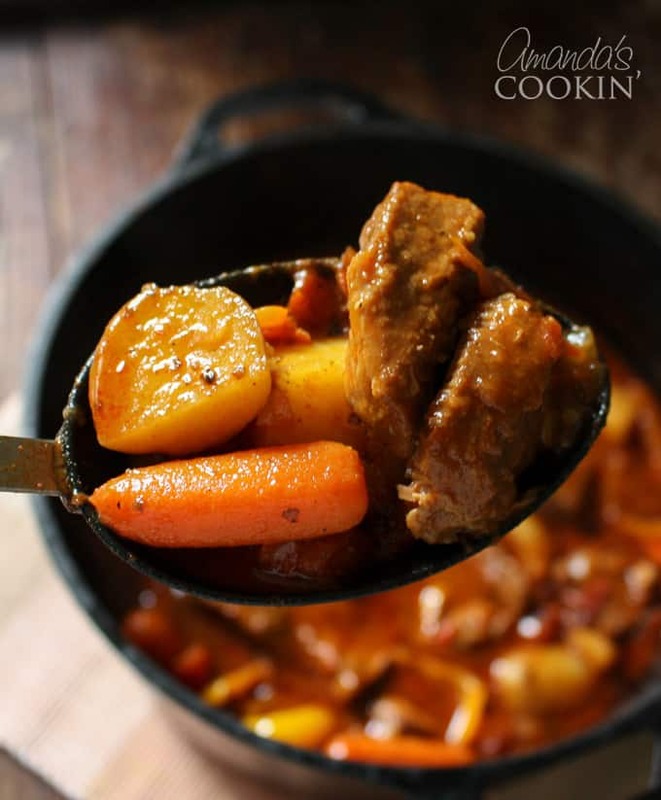 The recipe uses classic root vegetables and a rich broth along with chunks of protein packed beef chuck roast. Goulash is a meat based soup or stew with vegetables that has been seasoned with paprika. While it originates in Hungary, hence the commonly known name of Hungarian Goulash, it’s also quite popular in central and southern Europe, and of course in the United States. Most modern day families have a recipe for goulash that has been handed down from past generations. Goulash has taken on many different forms, cooked with different vegetables and pasta, and there are variations served with egg noodles, potatoes or even dumplings. Goulash can be prepared on the stove top, in the oven or even in the slow cooker. Did you know that back in the 9th century the cooked, flavored meat was dried out by the sun then packed into bags that were made from sheep’s stomach? This allowed Hungarian shepherds to simply add water to make a meal while out tending their flock. Luckily we don’t need sheep’s stomachs anymore and can keep our meat in the refrigerator or freezer until ready to prepare! I used my Lodge Cast-Iron Dutch Oven for this recipe. You will find a printable version of this goulash recipe below. 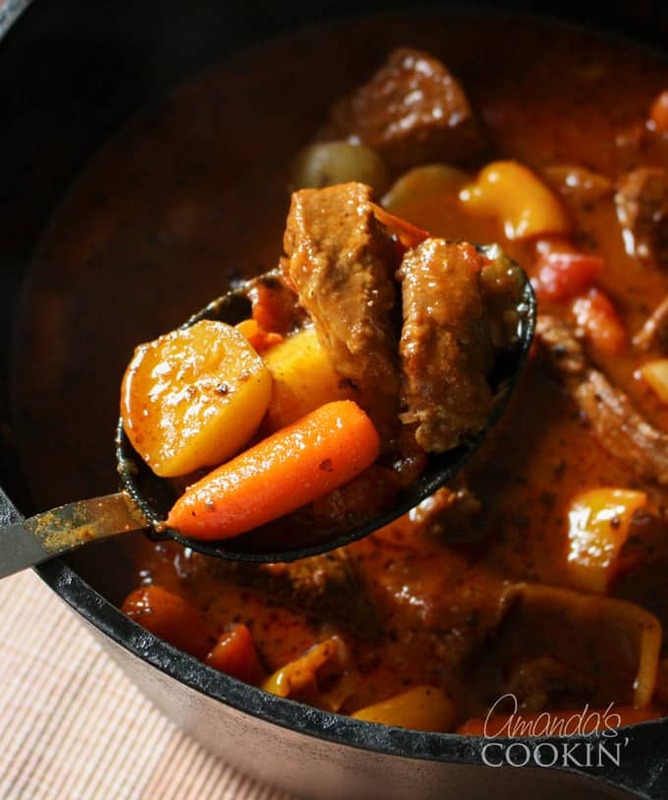 Does your family have a favorite goulash recipe? How do you make yours? For a different spin on goulash, try making American turkey goulash, beef goulash with dumplings, or Hungarian goulash with peas and carrots. Fall is also a great time for some crockpot java beef stew! If you enjoy hearty, beefy dishes, you will also like my beef burgundy in the crock pot. 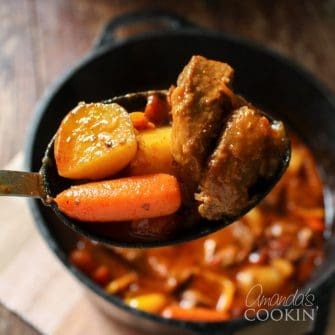 This warm and hearty meal of beef, potatoes, carrots and a savory gravy is pure comfort food. Combine paprika, caraway seeds, marjoram, Kosher salt, black pepper and flour in a large plastic zipper bag. Place cubed meat into the bag and close, then shake to coat. In Dutch oven over medium heat sauté chopped onion in olive oil until tender, about 3-4 minutes. Add garlic and sauté another 30 seconds. Add entire contents of meat shaking bag to the onion mixture in the pan. Cook, turning occasionally until meat is browned well. Add beef broth, Worcestershire sauce and canned tomatoes (including its juices) and stir. Bring to a boil then reduce heat to low and simmer uncovered for one hour. Add the baby carrots and potatoes and stir. Cover and cook on low for one hour. Add chopped sweet peppers and stir. Cover and cook another 30 minutes or until meat and vegetables are fork tender. This post originally appeared here on Oct 28, 2015. I made this dish tonight and it was delish! The beef was so tender and the broth was so flavorful, amazing over mashed potatoes but just as good by itself. I just found this on pinterest and made it tonight. This might be the BEST THING I’VE EVER MADE. EVER. I followed the recipe to a tee and had my doubts along the way, but holyyyyyy cow. Amazing. Thank you so much for bringing this into my life! Where did you find sweet paprika? I think this sounds like a perfect recipe for the crock pot. Thank you.